One summer at my family’s cabin when I was about 7 years old, I caught two tiny, slimy frogs that were hopping around the yard and shoved one into each of my 1 year old sister’s dress pockets. Then, I buttoned the pockets shut. Not being old enough to rat me out, or to unbutton them, she spent the afternoon hysterical and freaked out as the trapped frogs wriggled in her dress. I of course, said nothing, not even when I heard my mother wondering aloud about what was making Caitlin so whiny that day. I don’t know who pulled those frogs out of her pockets or how long they were there but I do know that I didn’t get in trouble. This is my confession. Sorry Cait. I really am. My littlest sister, Caitlin, turned 21 on February 10th. I just love her. She is so wise, take charge, silly, caring and thoughtful. She is also a great shopping buddy and a good shoulder to cry on. Oh, and she’s beautiful too. I could go on all day about that girl, because I am so happy she is my sister. I didn’t always feel that way about her though. Being the oldest, I could not WAIT to live away from my siblings and have them out of my hair. Now, I miss them terribly every day and daydream about living in the same place as them again. Funny how that works. On to the birthday cupcakes! These are a good, simple confetti cake, which is what Caitlin requested. They are moist and very dense and great piled high with fluffy buttercream. You can also make them any colors you want. 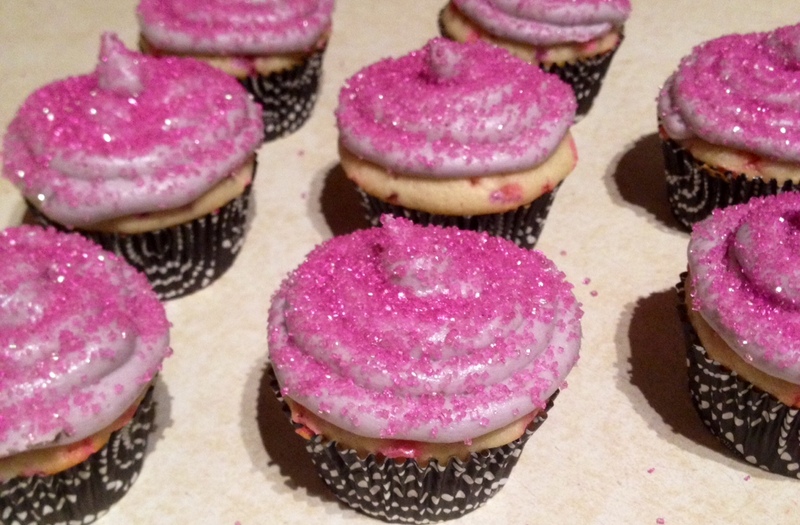 I used pink and purple sprinkles in the batter, with purple buttercream and sparkly sugar on top. They were perfect for the birthday girl, if I do say so myself. Preheat oven to 350 degrees. Line a muffin tin with 12 cupcake liners and set aside. Mix dry ingredients except sugar in a medium bowl and set aside. Melt butter in the microwave in a large microwave safe bowl. Whisk in sugar. Mixture will be grainy. Chill for a minute or two in the fridge. Stir wet ingredients together with sugar mixture. Add dry ingredients in two batches, stirring after each addition. Stir batter until lumps are gone and batter is thick. Add the sprinkles, stirring VERY carefully. If you over mix, the sprinkles will bleed and the cupcakes will discolor. Pour batter evenly into the 12 cupcake liners. Bake for 20 minutes or so. Test for doneness by inserting a toothpick in the center of a cupcake. If it comes out clean, they are done. Cool. Once cupcakes are cool, make the buttercream. Whip butter until light and fluffy. Add the powdered sugar and stir slowly until it is incorporated. Stir in milk, vanilla, salt and food coloring. Beat on high for a few minutes until light and fluffy. Frost and decorate cupcakes as desired. I used a Wilton 12 tip to frost and coarse sanding sugar to sprinkle on top. To keep them fresh, I like to keep the cupcakes cool until ready to serve, taking them out about an hour or so before eating. *I prefer to use sprinkles in the batter, not non-pareils (the round ones). Non-pareils bleed their color very easily.